Former Newcastle striker Alan Shearer thinks Man City’s bid to win the quadruple will be foiled by Lionel Messi. 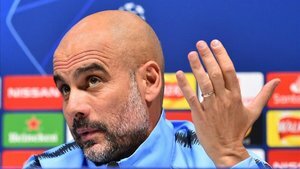 Shearer: "Messi es la razón por la que Guardiola no ganará el 'cuatriplete'"
“Looking at the Champions League draw, if Pep Guardiola's side make the final then I would expect Barca to be their opponents in Madrid, and I don't think they would beat them,”r; said Shearer, a BBC pundit nowadays. Shearer spoke about City’s hopes in the competition. “They should get past Tottenham in the quarter-finals, although Tuesday's first leg at Spurs' new stadium will be a big occasion and it is going to be tough for them,”r; explained the former hitman. “Get through that and it is either Juventus or Ajax in the semi-finals. Again, there is no easy option there, so it is definitely going to be the hardest competition for them to win.